Cindi (who I met on last year’s fall kayaking/hiking trip and have been friends with ever since) and I took off on the five-hour road trip Thursday morning and got to Brevard, North Carolina, mid-afternoon for the four-day weekend. I knew her and the walking Meet-up group leader, Rita, who arranged this event — and met five new adventurers when we got there. 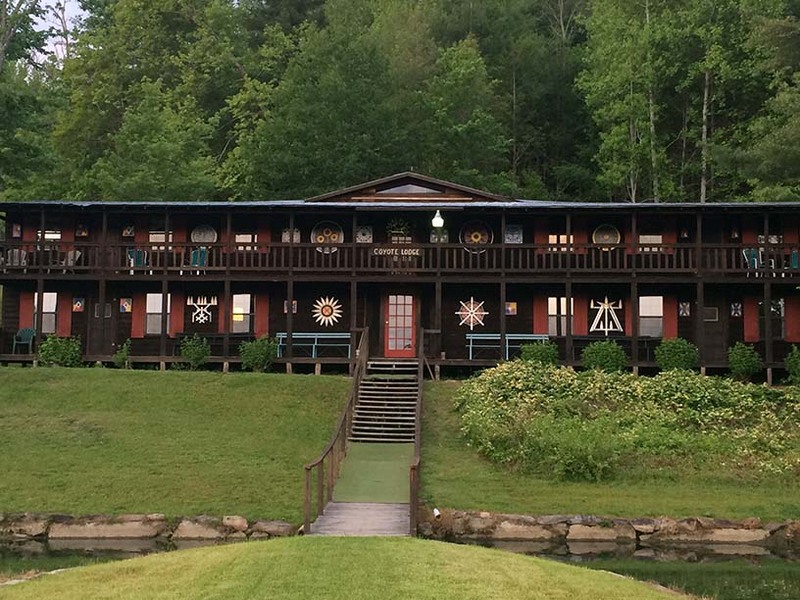 If you ever go to Brevard, stay at Deerewood Lodge and Cabins; it’s absolutely the coolest place. Went there last fall and couldn’t wait to go back. 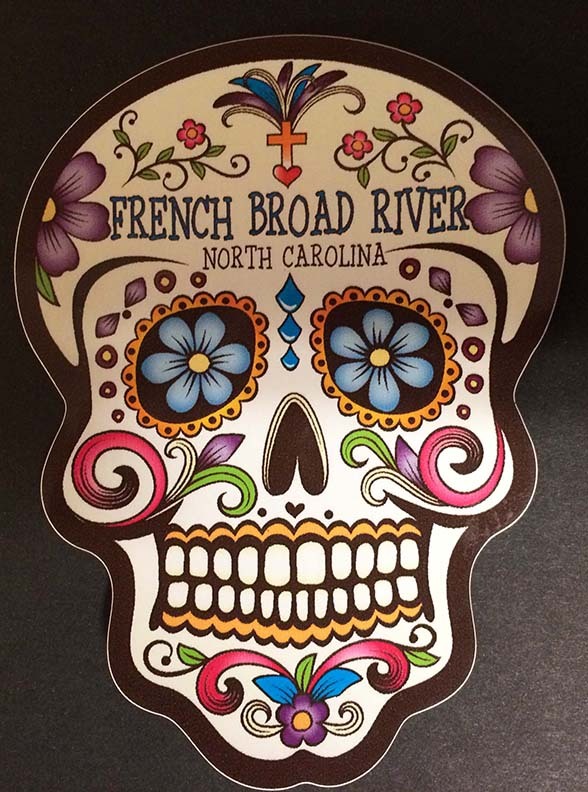 The next morning, we took off for a 10-mile kayak trip down the French Broad River. We did the same route (eight miles of it) last fall, but this time we added an extra two miles to the end. The outfitting company drove us to the start of the trip, got us into kayaks (sit-on-tops this time, instead of sit-in kayaks). We had a really enjoyable kayak trip down the river. The temperature was perfect, the surroundings were green, and clusters of Confederate jasmine growing along the shore smelled heavenly. The predicted rain held off, except for a few sprinkles, so it was a gorgeous spring day. 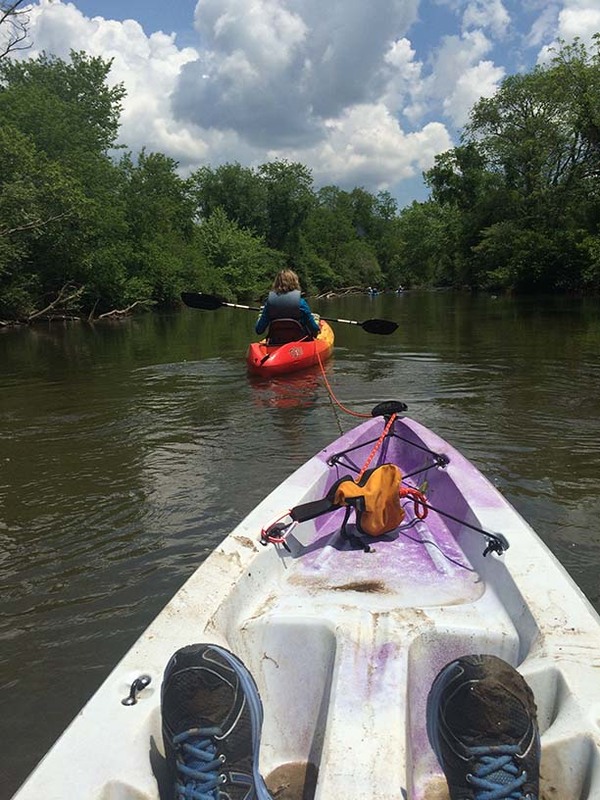 During the last two miles, the river took a sharp turn, and I was surprised to see a giant area of swirling water around the bend and one of my new friends in her kayak pinned up against a giant tree trunk that crossed two-thirds of the water. I tried to steer away from her and around the tree, but the water was moving way too fast and it pushed me toward her. I yelled, “I’m gonna hit you!” so she could brace for the impact. When I did slam into her, my kayak flipped and I fell into the cold, rushing rapids. I went down to the bottom and saw the pebbles there, and pushed my way up. But all I could see and feel were kayaks above me — just could not find the edge of them to get out of the water. 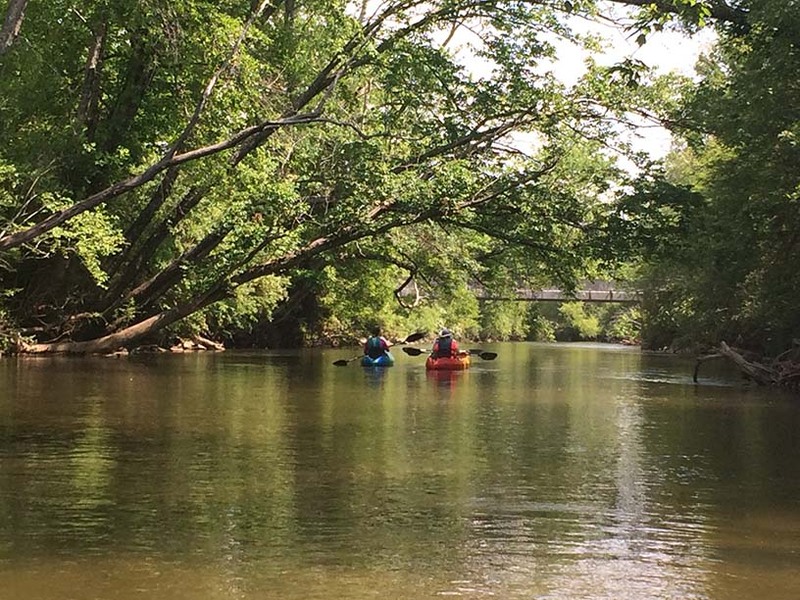 I remember thinking, “I’m going to die” if I don’t find the edge of the kayaks and “the light.” It felt like there was five kayaks above me — and it occurred to me that maybe our two kayaks were lengthwise — so I kept reaching and feeling for an opening. For some reason, I opened my mouth to gasp for air under water as I moved toward the light, and swallowed several big mouth-fulls of river water before I finally pushed up and out of the water in between two big branches of the downed tree. My legs were shaking wildly and my heart felt like it would beat out of my chest as I wheezed and tried to pull in air. Then I felt somebody else under the water bumping into my legs and looked down to reach for them, thinking it was the woman I’d hit who’d fallen into the water, but the person who popped up next was the leader of the group. She’d been behind us and seen me flip over, and ended up going under herself. It was so incredibly scary! The three of us were shell-shocked but alive – yay! Unfortunately, two of our kayaks had floated away during “the incident,” along with all three paddles, and the third kayak was wedged under the fallen tree. We all three had to slam our bodies as hard as we could on the kayak stuck under the tree to free it, but we finally got it. We all held our arms across it, gripping for dear life, as we walked side-by-side slowly downstream. Our friends who’d been ahead of us (luckily) caught the kayaks and two of the three paddles. Without the third paddle, though, I had no choice but to get on as a passenger on one of the women’s kayaks, and Rita slowly paddled us down the river. It was pretty unstable with two people perched in the middle of a sit-on-top and it felt like any movement would’ve tipped us over again. We all wanted to kiss the ground when we finally got to the boat landing! But we dragged the kayaks up about six steep cement steps, and in a few minutes, the outfitter people came in their bus to pick us up. When we got back, all I wanted to do with go lie on the bed for a while and hunker down and rest. But fellow adventurers kept texting me and I got up. Found out they’d Googled “adult river water ingestion” in the meantime to see if we should do anything! 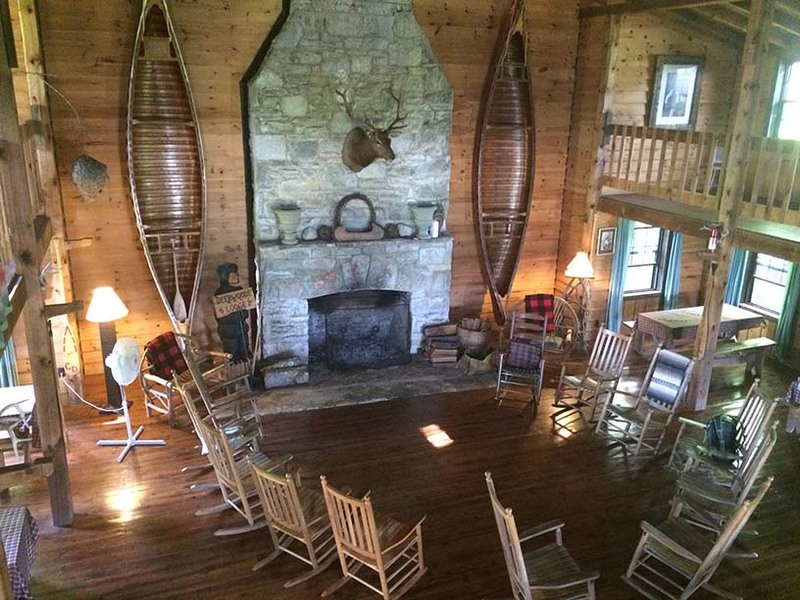 We had dinner in the lodge, which we had to ourselves the whole weekend — and I don’t think I’ve been hugged so many times in my life as that afternoon and evening! Everyone was so kind and thoughtful. 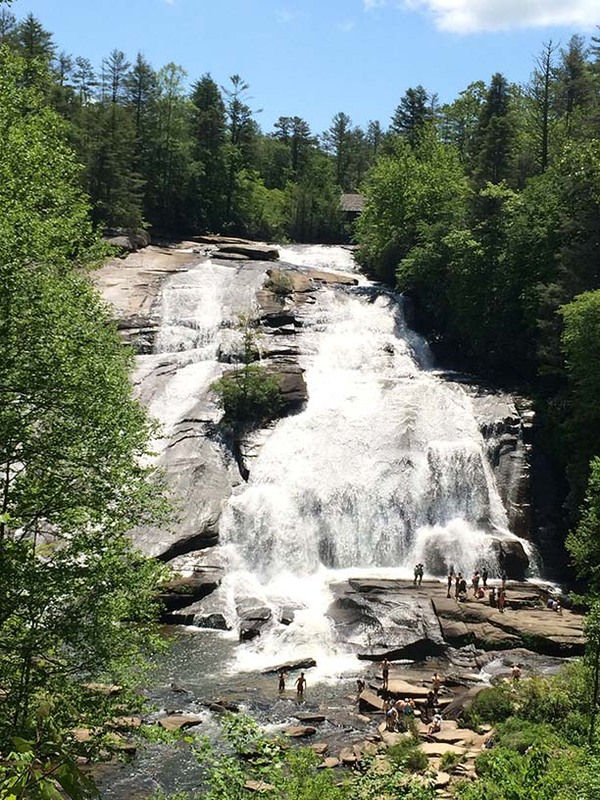 The next day, we hiked for hours and saw three beautiful waterfalls. The excitement on that trip was a medium-sized black snake that was three feet away and slithering intently toward us. We kept to the middle of the trail as much as possible after that. The hiking area was pretty busy that day with adults, school children, dogs, horses and mountain bikers. 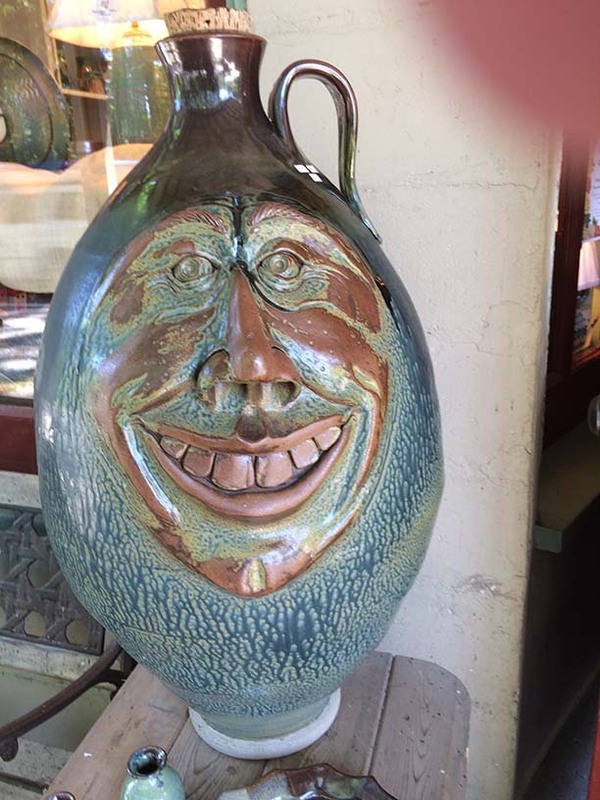 After the hike, we did some caravan-style shopping in local art and pottery shops, which was fun. Went back to the lodge, and some of us made a final run into town to buy souvenirs before the stores closed at 5. At dinner in the lodge that evening, two women pulled out “awards” they’d bought for some of us involved in “the incident” — one woman got a Brevard bumper sticker (it had been her first kayak trip, so it was like her badge of honor) and they gave me a funky, hippy skull sticker with flowers on it — and we all burst out laughing. The rest of the evening we played board games, drank wine and chilled. During the night, , the rain (which had been originally forecast for the whole four-day period) finally came, so we put on our raincoats with hoods, packed our stuff in the cars and hit the road for home. Thank you all from the bottom of my heart for your friendship and a weekend I’ll never forget! 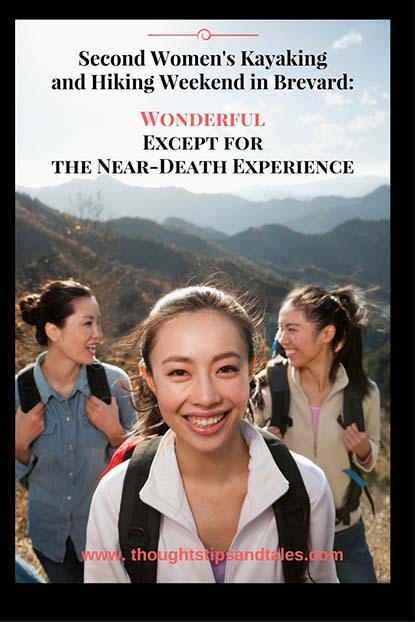 This entry was posted in friends, kayaking and hiking, travel and tagged female friends, hiking, kayaking, kayaking and hiking, near-death experience, women over 50, womens outdoor adventures. Bookmark the permalink. Oh my gosh, that’s unreal! Thank goodness you are ok and other too of course. No life vests – or did I miss that part? Well, at least it all turned out well and you ended up having a good time. Me, I’ll keep my feet on dry land lol. Definitely had a life jacket on but they can’t protect you from everything, I found out! oh wow and even with a life jacket on you still were submerged! Good to know. I would have thought it would have kept you afloat! I kept bobbing to the top of the water and hitting the kayaks: there were 3 kayaks and a giant tree limb in the water (which must’ve been about 11 feet across), and I couldn’t find my way past them to a spot to get ouy and get air. Shows you people can drown wearing a life jacket in 4 feet of water! That sounds like a great weekend and I’m glad you are ok. There was a fatal kayaking accident here over the weekend. It is dangerous because you don’t know the river. I’d like to try it more this summer but I’m afraid to go too far. Which kind of kayak do you prefer–the sit on top or sit in? There are actually pedal powered kayaks, too. I know I would like one of them, but they are really expensive. It was a great trip besides the water incident; we did a lot of talking and laughing. I own a sit-on-top and a small kayak (bought them when Max was 16 or so) but when I rent them on local trips, prefer a sit-in. People last weekend were talking about the pedal powered kayaks, and I’d never heard of those. Sounds interesting! I really like that hiking area. Huge water flow and the kayaking scenario is nice. 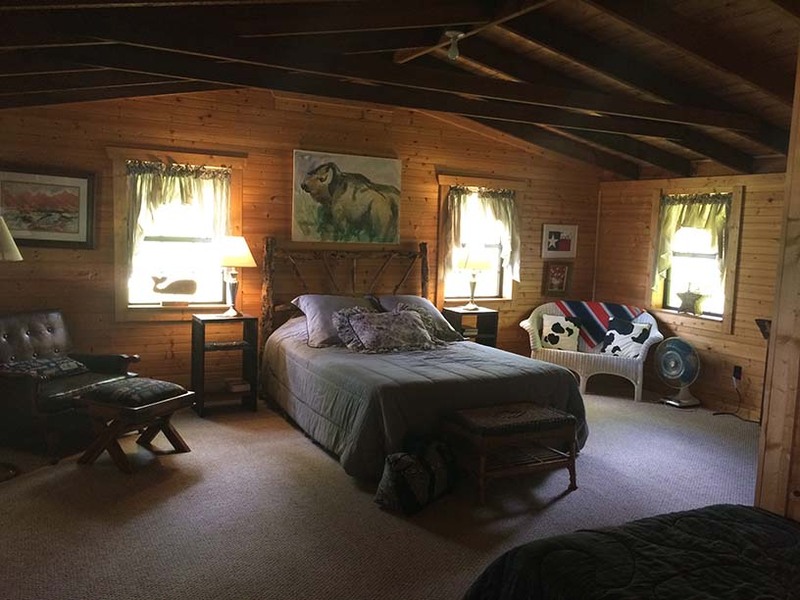 Brevard, Deerwood Lodge is an extremely good place to stay while you’re traveling to North Carolina.